This offer is valid if you buy Duplicate Photos Fixer Pro before Friday, April 19, 2019 - so don't miss out on this incredible opportunity. Over 10 million people have already chosen Duplicate Photos Fixer Pro! Why do I need Duplicate Photos Fixer? 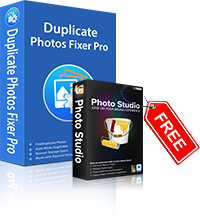 Duplicate Photos Fixer Pro is the ultimate tool for removing duplicate and similar photos from your Windows PC. You'll never have to waste time again finding and removing the hundreds - or thousands - of duplicates and near-duplicates on your PC. This nifty tool will help you recover loads of hard disk space! This is a one year license and will be billed annually. Remember - 2 minutes of your time could save you tons of frustration by removing all duplicate photos from your PC automatically with Duplicate Photos Fixer!